Now this time to add a new social link button on your blog.So today i am going to releasing a new mouseover social link button for blogger.Called Galauness social link button.it's to simple and good looking,Add this button widget in your blog and make your blog look like beautiful,Galauness social link button is too easy to add in blogger. 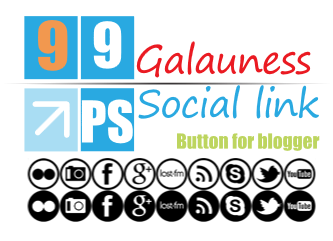 Now if u don't have a social link button on your blog then Galauness button is good for your blog. Follow below steps and add this button widget in your blog. Step:-1 Go to your >>blogger dashboard and then go to >>template section in template section click on >>edit HTML button. Step:-2 Now find ]]></b:skin> tag using " ctrl + f " from your keyboard. You can remove any icon from this method.Remember only remove.